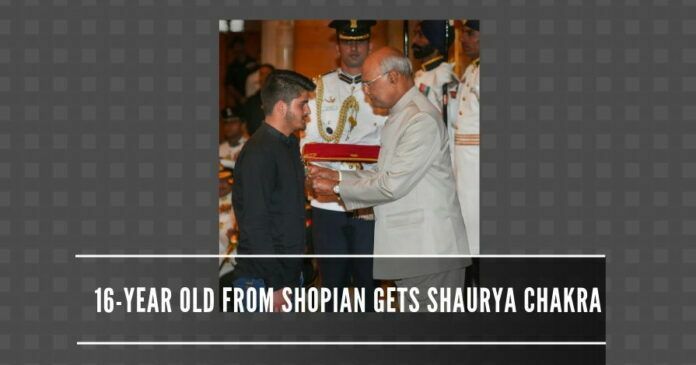 In one of those rare occasions, President Ram Nath Kovind on Tuesday awarded Shaurya Chakra to a 16-year-old Irfan Ramzan Sheikh for fighting militants who attacked his residence in Shopian district of Jammu and Kashmir. Shaurya Chakra is usually awarded to armed forces and para-military personnel for “gallantry otherwise in the face of the enemy”. When Sheikh, the eldest son of Mohammad Ramzan, opened the door, he found three militants in the verandah of the house armed with rifles and grenades. The 14-year-old Sheikh put up a brave fight with the militants by pouncing on them, which led to the militants running away from the area. Currently, studying in Class X, Sheikh aspires to become an Indian Police Service (IPS) officer. “Sensing that the militants could harm his family, he exhibited the highest degree of courage and faced the militants for some time so as to avoid their entry inside the house. In meantime, his father came out and the militants pounced on him, resulting in a scuffle,” the citation for the award read. Sheikh did not think for a moment for his own safety and pounced upon the militants for safeguarding the life of his father and other family members, it read. The militants also resorted to indiscriminate firing, resulting in severe injury to Sheikh’s father. He later succumbed. However, Sheikh did not lose courage and continued to engage in a scuffle with one of the militants, who resorted to indiscriminate firing resulting in severe injuries to the militant as well. On seeing one of their associates injured, the militants tried to flee. However, Sheikh chased them and they left the body of their fellow militant behind. “Irfan Ramzan Sheikh exhibited the extraordinary show of bravery and maturity in such a small age,” the citation read. This brave boy who wishes to become a police officer is a ray of hope from the troubled Valley and the entire country must support him, rather than the fake guys propped up by the media. If only there were more Bravehearts likes Irfan who did not yield to militants like most in his fraternity do. Salute to Irfan for his exemplary courage in the face of such adversity. Irfan should be an idol for his other Kashmiris brethren. Wish him all the best in his aspirations.